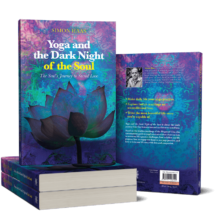 This month I’d love to draw your attention to the beautiful new book just out – ‘Yoga and the Dark Night of the Soul, The Soul’s journey to Sacred Love’ by Simon Haas. This is one of those magical books that found me just when I needed it, every chapter seemed to be just right for the moment I discovered it. Don’t you love it when a book finds you like that? Yoga and the Dark Night of the Soul offers a powerful reframe of depression. Whilst modern day civilisation is fearful and ashamed of depression, hiding and medicating it, Ancient India saw darkness as a right of passage, a calling to sacred love, a gift. This book is about that right of passage, about the journey from fear and confusion to sacred love, unveiling the four stages to that journey. The book is full of relatable, inspiring stories from Simon’s life and the people around him as well as accessible illustrations from the Bhagavad Gita. While yoga has to some degree become part of the feel good industry and “oooh look at my amazing handstand on Instagram” this book brings us the true purpose of yoga with depth and authenticity, to follow your purpose, engage your heart in yoga practice and live a life of love and compassion. It is quite literally a breath of fresh air. Simon spent his childhood studying Sanskrit and the sacred writings of India and his teenage years living with monks the temples and monasteries of India. This is so far away from my own childhood growing up on a housing estate in Iver Heath, Bucks that it seems other worldly. He also apprenticed with an elderly master practitioner in the Bhakti tradition for 16 years. After returning to the UK to study Law at Cambridge University he now lives in Costa Rica practicing corporate law and is dedicated to making the ancient wisdom of India accessible to modern day. He is also the author of The Book of Dharma, Making enlightened choices.